A cartographic evaluation of the anthropogenic disturbance of vegetation is the most effective method for solving numerous issues of environmental protection and the rational use of biotic resources in the Baikal basin. It was carried out taking into account the major changes in the floristic composition and cenotic structure of vegetation, which is developing mainly under the influence of anthropogenic factors. The degree of anthropogenic disturbance of the vegetation was determined by deviation criteria of the composition and structure of plant communities from their native state. The evaluation is based on a modern universal map “Vegetation of the Baikal basin” 1:4, 000,000, which is created on the principles of a structural-dynamic classification of vegetation taking into account its main regional-typological features and dynamic processes caused by human and natural factors. Thus, invariants of epistructures of plant communities were established and thereby the base (zero) estimation level was defined, which was the starting point for the countdown of actual spontaneous and human-induced changes in the vegetation cover. Besides the universal geobotanic map, basic cartographic sources were used in assessing the vegetation disturbances. These sources provide information about the boundaries of arable land and farmland and forests damaged by technogenesis, recreation, and harmful insects, burnt sites and regenerated cutover stands. Forest and land use management materials and Google 2013 surveying satellite images were used. 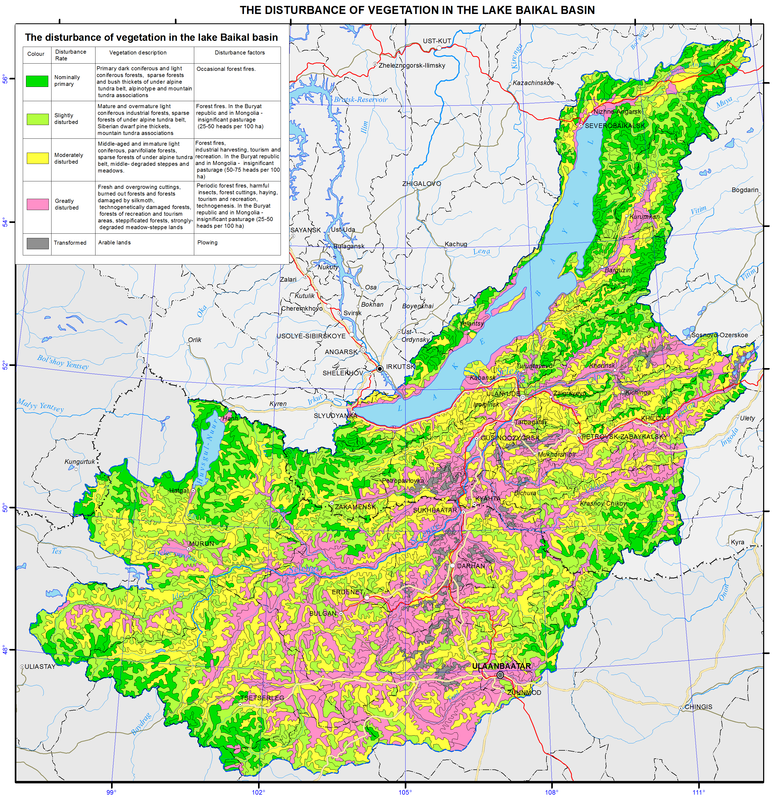 The disturbance of vegetation of the Baikal basin is determined primarily by its use as an industrial and agricultural resource, which is based on forests, grasslands and steppes. Industrial logging leads to a change of indigenous coniferous stands to small-leaved, less valuable for the economy. Abandoned semi-subsistence raw materials on slashes increase forest fire debris and entomological danger. Light coniferous forests located in the riversides, especially on fertile soils used for agriculture, are often cut. Besides logging, the forests in Irkutsk oblast, the Republic of Buryatia, Zabaikalsky krai, as well as in Mongolia are annually exposed to forest fire. Fire damages not only the forest but also the community of other vegetation types - mountain tundra, subalpine elfin cedar thickets, yerniks, steppes and others. That leads to the accumulation of large burnt areas, replacing native forests derivatives. Negative impact on the steppe vegetation is also caused by plowing and irrational use of grazing territory. As for the pastural digression of vegetation, it has completely or partially changed the floristic composition and structure of many steppe and meadow communities. In Mongolia, grazing currently remains the main type of agriculture. Here they raise cattle, sheep, camels, goats and horses, as well as Mongolian yaks and reindeer. Alpine pastures are even mountain-tundra, cryophyte steppe, marshy meadow and steppe. Vegetation communities of middle mountain, foothill, lowland areas and basins are widely used for pasture. Vegetation communities of floodplains and lakeshores with forest, meadow, prairie and wetland vegetation are especially strongly disturbed [Banzragch, et al, 1990]. In general, in Mongolia, as well as in Irkutsk oblast, the Republic of Buryatia and Zabaikalsky krai in the remote and undeveloped alpine areas, where there is no human activities, undisturbed (indigenous) vegetation is provisionally preserved. According to the development and availability of the areas, the assessment of vegetation disturbance is changing. As a result of the analysis and assessment of vegetation communities, five categories of vegetation disturbance are identified on the map – conditionally drastic, weakly, moderately, and strongly disturbed and reformed. Banzragch, D., Beckett, U., Buyan-Orshih, H., Munkhbayar, S., & Tsedendash, T. (1990). The map: Types of pastures. Scale 1:3,000,000. National atlas of the Mongolian People’s Republic. Moscow-Ulaanbaatar. p 102-103.